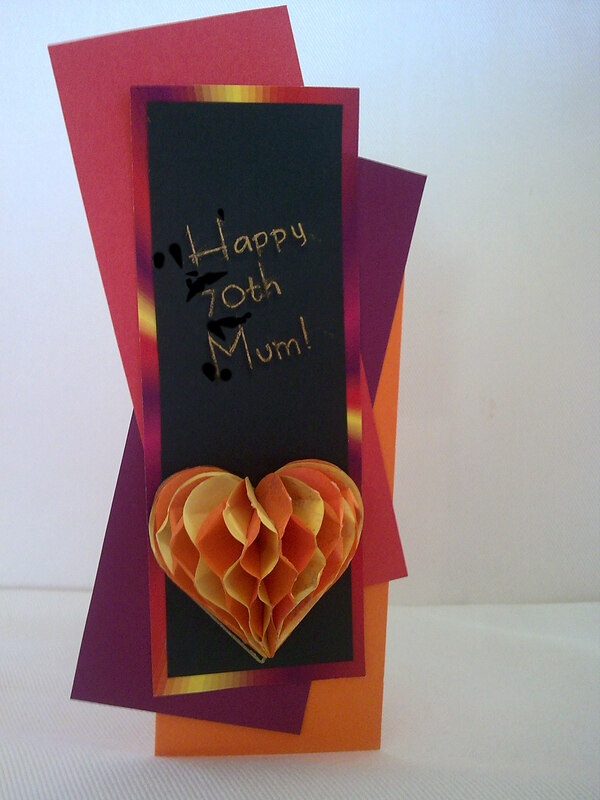 Last week I mentioned that I was working on a handmade card for Mother’s Day and my mum’s 70th birthday. Well the final version is shown below. Generally I am quite pleased with the results – I’m a bit cross about the smudges on the lettering! Next time I’ll let the gel ink dry longer! The original design is to make it look like a heart necklace but I couldn’t get hold of suitable wire in time for my mum’s birthday. I don’t think the card is any less attractive because of it though. I found the design for the card in a magazine – Cardmaking with Paper Sculpture – and I’ve been trying out a number of the suggestions. So far this is the best one. All the projects in the magazine were created by Greg Sukendro who is quite obviously a very talented crafter and designer. I’ll post some more of my projects as and when they come together! In Australia Mother’s Day is rapidly approaching. My son’s primary school have invited all us mum’s for a Kindy Mother’s Day picnic and we’re all looking forward to that. My son also attends a daycare centre and they are planning a Mother’s Day morning tea. Because the daycare centre have provided a great service for us over the past year I have been producing their monthly Newsletter on a pro bono basis for quite some time – it’s a way for me to give back something to a part of the community and something that I have always felt strongly about. Anyway, I offered to design a little invitation for the daycare centre which might help them improve the attendance at their morning tea. Frequently they offer us reminders on torn off pieces of A4 with simple printed messages that more often than not are filed in the bin before being looked at! Below is the result of a couple of hours work. I printed 85+ copies for the centre (4 invites to each A4 sheet – they cut them out!) and the whole project took approx 2 hours of my time. The manager at the centre loved them and I hope that the parents will have at least taken a moment to read them, rather than just crumpling them up! For an invitation like this I would normally charge $1.50 per invite printed on quality matt photo paper and including a magnet attached to the back. Sound reasonable? Maybe I can help you with your next party project! I’m also working on a Mother’s Day card, handmade with paper sculpture attached – which I will be amending slightly for my mum’s 70th birthday coming up this month – check back next week for the final photos. I’m not sure how it will work out as I’m trying a whole new skill with this one!